As early as the 9th century, Shchi has been a staple on the Russian table. Russians have a proverb that states “Щи да каша – пища наша.” (Shchi da kasha – pishcha nasha “Shchi and kasha are our staples”). 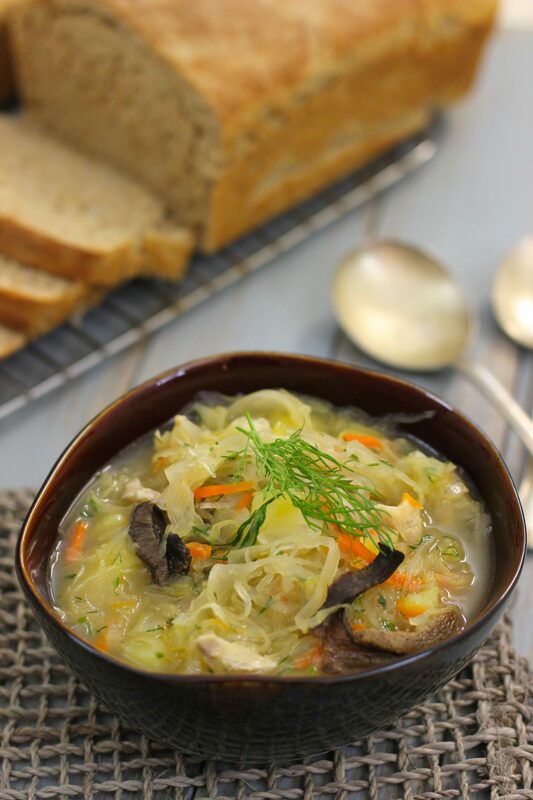 Not only does it have the sour taste that Russians love from the sauerkraut, but the ingredients of the soup are perfect for the long Russian winters. Cabbage, sauerkraut and potatoes are all ingredients that could be grown in Russia even with the short summer season and then stored throughout the long winter in the cellar. Dry mushrooms were also used in many different ways and I absolutely love them in this soup. They add such an incredible depth and amazing flavor to the soup. I don’t recommend leaving them out:) You can use any kind of meat in shchi or even make a vegetarian version by omitting the meat and using vegetable broth. 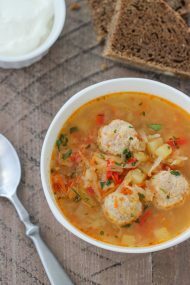 Our whole family loves this soup, even my younger siblings who grew up in America and don’t have the Russian taste buds as much as my parents or I do. It’s one of my favorites and I make this all the time. It cooks very quickly, doesn’t have any fancy shmancy ingredients or steps and best of all, it’s a super candidate for leftovers. It even tastes better the next day. I usually make this right before working my 3 (12 hour) night shifts and that way I can get some sleep since dinner is already cooked. With a dollop of sour cream, some fresh minced herbs and a slice of Russian Black Bread, this is as Russian as it gets:). If you have Chicken Broth ready, use it. If not, cook a skinless chicken drumstick, thigh and breast with a bay leaf and a few peppercorns for about 30-45 minutes. Season with salt. Strain the broth through a fine mesh sieve lined with a paper towel or cheesecloth. Take the chicken off the bone, and use a fork or knife to shred it into bite sized pieces. Chop the potatoes, and finely shred the cabbage. Bring the chicken broth to a boil. 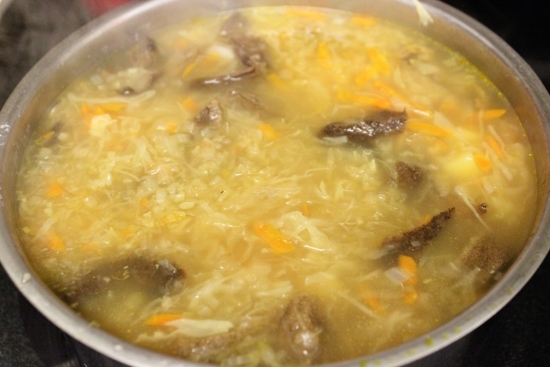 Add the potatoes, cabbage and sauerkraut to the broth. 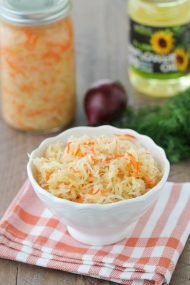 Of course, homemade sauerkraut is best, but you can use store bought. 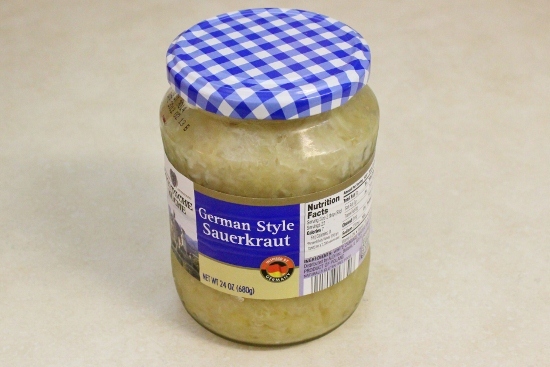 If the sauerkraut is too sour, rinse it in water first. By the way, if you don’t have fresh cabbage in the refrigerator, just leave it out. I make shchi with only sauerkraut most of the time anyway. 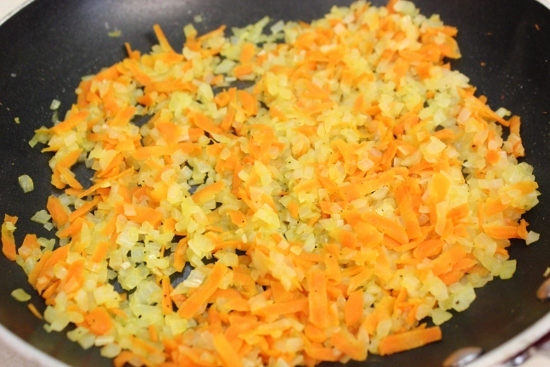 Reduce the heat to a simmer and cook until the potatoes and cabbage are tender, 20-30 minutes. 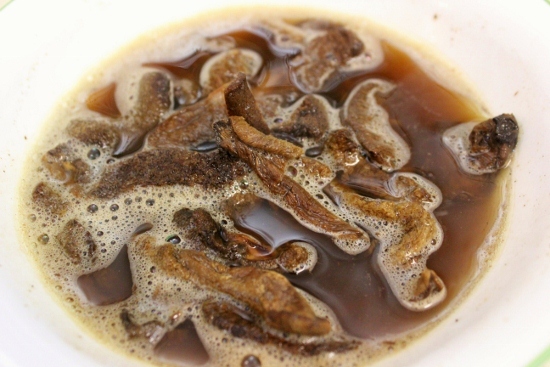 Meanwhile, rehydrate the dry mushrooms in about 1/2-1 cup water. Cover with plastic wrap, poke a few holes in it and microwave for 1-2 minutes. Or pour boiling water over the mushrooms and let them steep for 5-7 minutes. Strain the mushroom liquid through a coffee filter. Add the mushrooms and mushroom liquid to the soup. Melt the butter in a skillet. Add the onions and carrots. Season with salt and pepper. Cook for about 5-7 minutes until they are tender. Add to the soup. Add the cooked chicken to the soup at the very end, giving it just enough time to heat through. When the soup is cooked, garnish with fresh herbs and serve with a dollop of sour cream in each bowl. If you have Chicken Broth ready, use it. 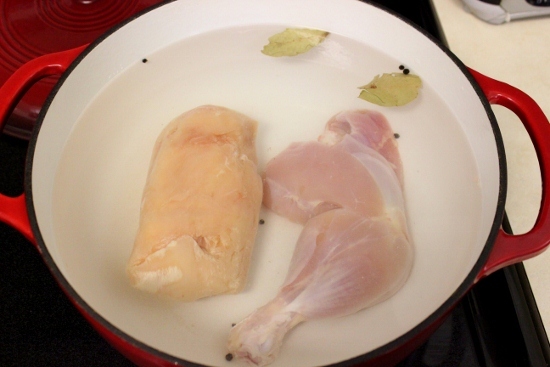 If not, cook a skinless chicken drumstick, thigh and breast with a bayleaf and a few peppercorns for about 30-45 minutes. Season with salt. Strain the broth through a fine mesh sieve lined with a paper towel or cheesecloth. Take the chicken off the bone, and use a fork or knife to shred it into bite sized pieces. 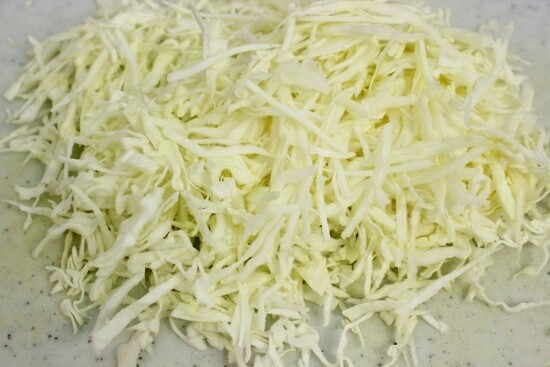 Chop the potatoes, and finely shred the cabbage. Bring the chicken broth to a boil. Add the potatoes, cabbage and sauerkraut to the broth. 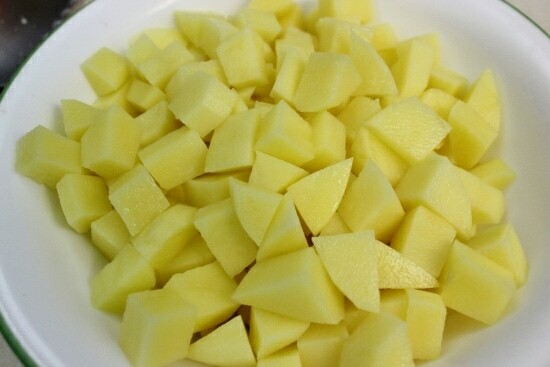 Reduce the heat to a simmer and cook until the potatoes and cabbage are tender, 20-30 minutes. Meanwhile, rehydrate the dry mushrooms in the water. Cover with plastic wrap, poke a few holes in it and microwave for 1-2 minutes. Strain the mushroom liquid through a coffee filter. Add the mushrooms and mushroom liquid to the soup. Melt the butter in a skillet. Add the onions and carrots. Season with salt and pepper. Cook for about 5-7 minutes until they are tender. Add to the soup. Add the cooked chicken to the soup at the very end, giving it just enough time to heat through. When the soup is cooked, garnish with fresh herbs and serve with a dallop of sour cream in each bowl. I have never tried this dish. It’s not something I would normally eat but my taste buds have drastically changed (aged? matured?) 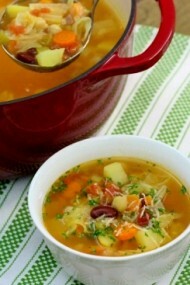 over the years and I find myself longing to try a cabbage soup. And with mushrooms in it? Sold. Where do you get dry mushrooms? I haven seen them in USA? Dry mushrooms are sold in most grocery stores, usually next to the herbs and fresh mushrooms. I buy mine in bulk online – http://nuts.com/cookingbaking/mushrooms/porcini-mushrooms.html. A dried mushroom mix is sold at Costco as well. 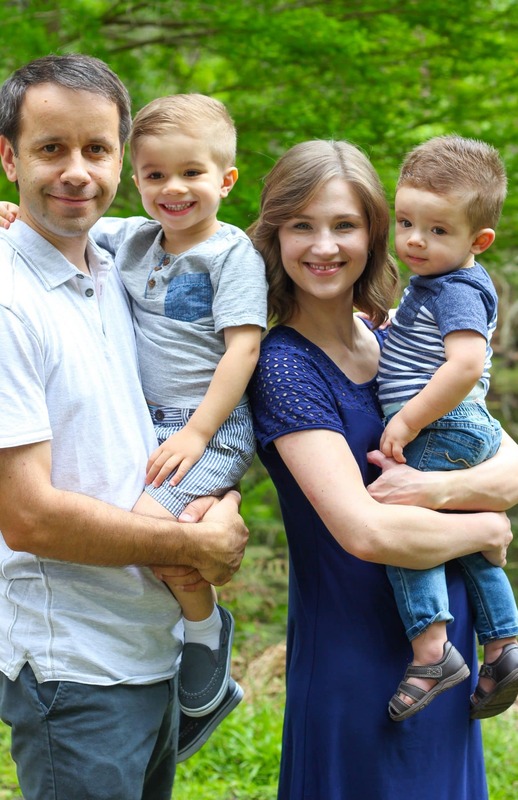 I just wanted to stop by and say how much I enjoy reading your blog. Great job! I’m from Eastern Europe and our cuisines are so much alike. Thank you so much! P.S. I’ll make the soup tonight 🙂 with sour cream of course! I can eat sour cream with almost everything. I’m so glad you stopped by:). 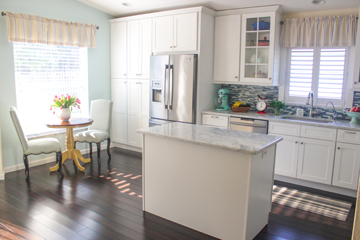 Hope you’ll be able to enjoy more recipes. Can you use fresh mushrooms or its going to be a different taste? Oksana, If you use fresh mushrooms, the taste will be completely different. If you don’t want to use dry mushrooms, you can just omit them completely. If you strain the liquid from the mushrooms, why do you put it back in? That’s a great question, Debbie. Dry mushrooms tend to have a lot of grit on them. I wash them really thoroughly before I add them to the soup.If you don’t wash the mushrooms and then strain the liquid the soup will be very gritty. The liquid in which the mushrooms steep is very flavorful so I add it back to the soup. It’s optional though, you can discard the porcini liquid, but I think it gives a really rich, savory taste to the soup. Olga, You didnt add the dried mushrooms to your ingredient list. how much do you use? I’ll fix it. I usually put in about 1/4 -1/3 cup of dried mushrooms. It’s really up to you and how much you want to use. I like a lot of mushrooms, so I put in quite a bit. I studied abroad in St. Petersburg some years ago and found myself missing my hostess’s shchi. This was just as good if not better than what I remembered from one of my favorite dinners while I was in Russia. Thank you for sharing this. What a wonderful experience, Hannah. I’m so glad you enjoyed this soup. Hi! You mention butter, but don’t specify an amount. I’m sorry about that, J. I updated the recipe; you will need about 1 Tablespoon butter or oil. I see that you have “1 cup cooked chicken, cut or shredded into bite sized pieces” in the list of ingredients but I don’t see them being used anywhere. When. where and how are you using them in this recipe? You need to add it to the soup at the end of cooking, just long enough to reheat. I’m sorry I wasn’t more clear in the instructions. 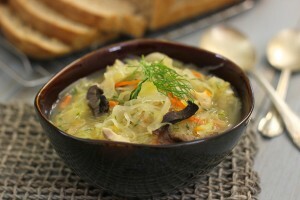 Olga, this shchi seems wonderful, but compared with other recipes it has less cabbage (1 cup). Would it still work with, say, 3 or 4 cups of shredded cabbage? Or is that a “no-no” for this type of soup? I’m so happy to hear that you enjoyed it, Gloria. It’s on my menu for this week too:). European taste buds can be interesting, lol. My sister and her family are vegan, so I have some practice converting recipes to vegan. I LOVE the vegan sour cream from Whole Foods. Hi Olga! 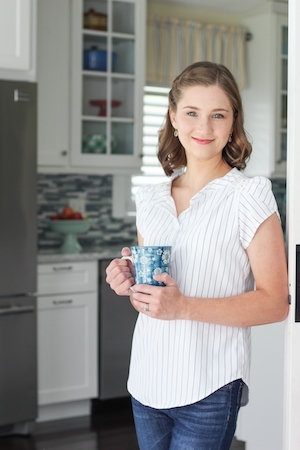 Is it possible to use beef broth? Have u ever tried it? Yes, you can use whatever broth you like, Nicole. I prefer the flavor of chicken broth, but you can use beef or even vegetable broth if you like. I have recipes for both Beef Broth and Vegetable Broth on my blog. how long do you cook mushrooms?they suppose to be really soft right? Yes, the mushrooms should be soft and tender, Katie. The time depends on what kind of dry mushrooms you are using. I buy porcini mushrooms from nuts.com and they get really soft and tender in about 30 minutes, but I’ve used other porcini mushrooms that I bought from other grocery stores and they took much longer to cook and still don’t get as tender as the nuts.com mushrooms – not an advertisement:). I’m just a happy customer. Wash lamb, and put in a 4 qt. Pot. cabbage. Cook 1 hour. Serves six. We use short ribs instead of lamb. Could kasha (buckwhaet) be added instead of potatoes? You probably can, Kim, but it will be a completely different soup. I prefer using potatoes, but you can make it however you like.